When you launch your body from a height into thin air, it is a combination of interlinked tools and equipment that prevent an otherwise sudden impact with the ground below. A harness, some carabiner links, a few cables, straps and other measures. Each uniquely designed, manufactured and positioned in the right place to do the job of keeping one safe and uninjured. 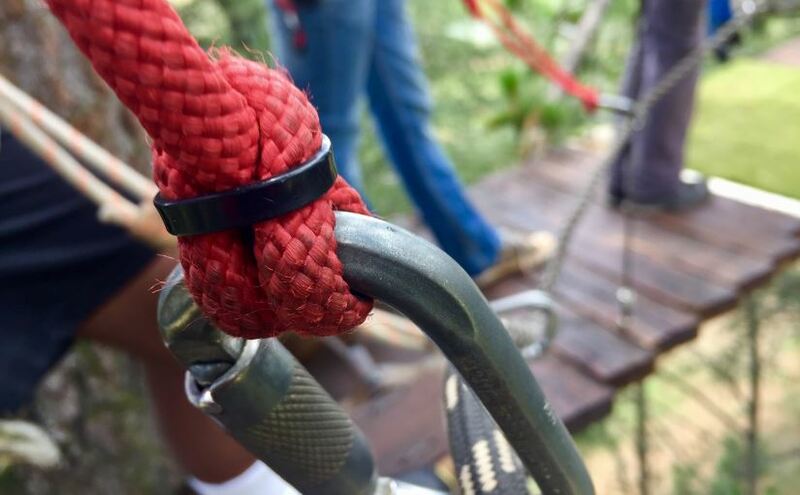 This allows the user, be they on a swing or cable ride, to enjoy the actual experience – possibly with all the same anxieties still – but without the real fear! With Christmas around the corner – already – it would be pertinent to tie in our adventure park tools with the bringing together theme that the Season invokes. Whilst we are all individuals in our own rights, many of us are part of larger families and communities. Just as the chain-links keep us on a cable high above the ground, so too does a supportive family or friend base keep our lives from crashing. Each relationship with lover, spouse, sibling or child are linked with strong emotional carabiners, harnesses and tethers. But, just as these tools weather and fade, so too do our relationships – still in existence of course, but in need of maintenance. There is not much else that regenerates a feel of togetherness, a building of memories, and a platform for bonding, than good adrenaline filled family fun! All Out Adventures will take the bonds and links from between the family members; brush off the rust, oil the squeaks and finish them off with a polished gloss. Get your family pumped with the Christmas spirit by chucking them all into pulse-racing activities that both challenge and excite their personal boundaries. By opening these, they are better able to bond with others. Then, just close your eyes… leap… and listen for the little click and clack of the safety features taking the slack. That’s what family do.